American Mystery Classics, 9781613161227, 240pp. The note discovered beside Rosaleen Wright's hanged body is full of reasons justifying her suicide--but it lacks her trademark vitality and wit, and, most importantly, her signature. So the note alone is far from enough to convince her best friend Jane that Rosaleen was her own murderer, even if the police quickly accept the possibility as fact. Instead, Jane suspects Rosaleen's boss, New York theater impresario Luther Grandison. To the world at large, he's powerful and charismatic, but Rosaleen's letters to Jane described a duplicitous, greedy man who would no doubt kill to protect his secrets. If Rosaleen stumbled upon one such secret, it could have led to an untimely demise--and Jane risks a similar end when she takes a job with Grandison's company, tangling with one of Broadway's deadliest actors in a desperate play for the truth. 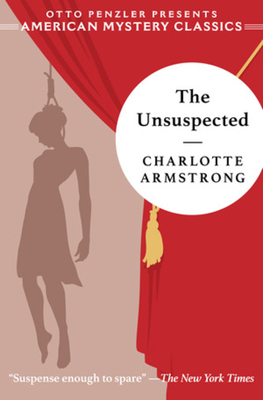 A playwright before she turned to crime fiction, Charlotte Armstrong drew from her experience in the theater for her fourth novel, The Unsuspected. The book inspired the 1947 film of the same name.